Wire netting (or chicken wire) is a cheap method of securing acoustic mineral wool between joists of separating floors. 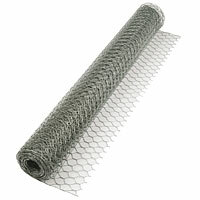 Wire netting is also useful to secure acoustic mineral wool if it is being inserted from below. It is important that to get the best results, acoustic mineral wool must be a loose fit between the joists which means it will easily fall out until the ceiling is installed. By fixing wire netting to the underside of the joists, the mineral wool can be inserted on top of the mesh in stages until the entire ceiling has been treated.